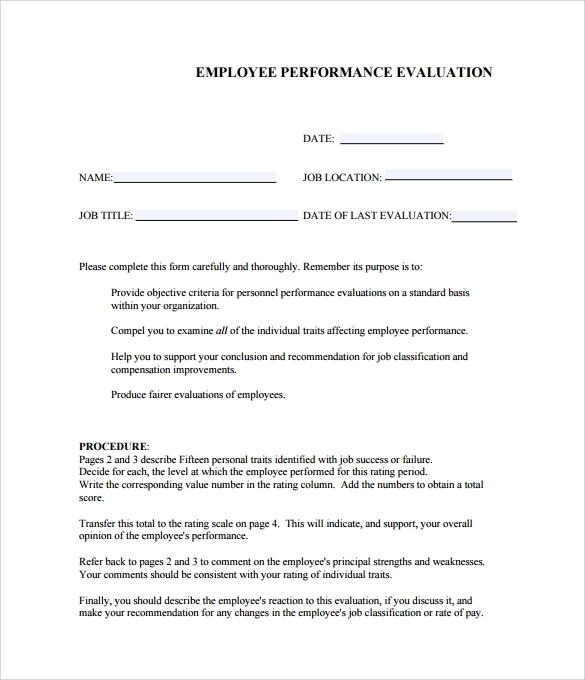 When an employer or manager wants to find out the status of their employee at work according to the companies standards, the sample performance evaluation form can help them with the task. An assessment tool that any managers can refer to rate their employees when it comes to their knowledge, skills and attitude while performing the task given to them. 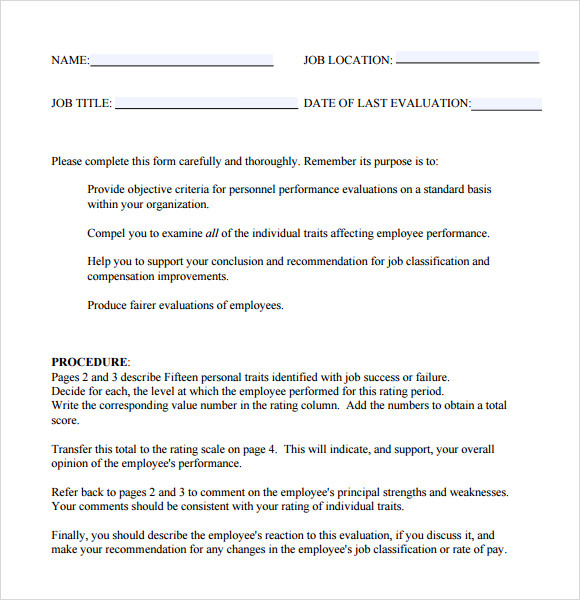 An example template has the preferred downloadable format you can have for the Sample Evaluation Templates you can copy for the evaluation of the companies’ personnel’s. The sample performance evaluation can give the areas that needs improvement and corrected for them to become an efficient employee. 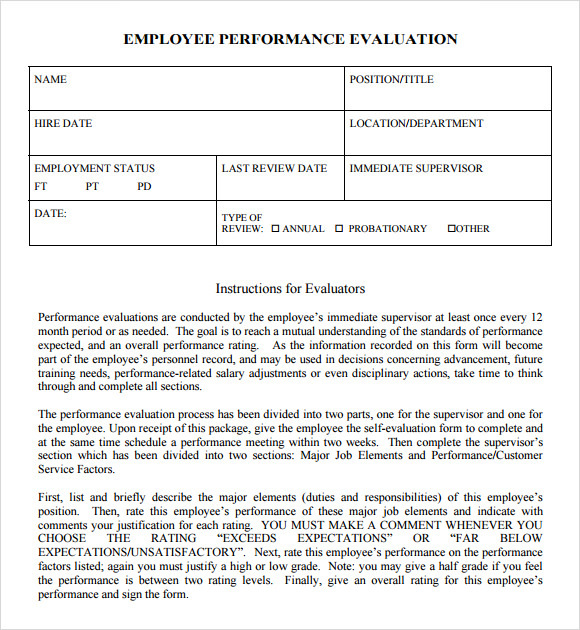 This performance evaluation sample PDF, as the name suggests, is a template for evaluating performances, which serves as a sample to show what exactly a performance evaluation template looks like. It is available in PDF format. It includes the date, name, job location, job title, and last date of evaluation, points to remember, and the procedure. 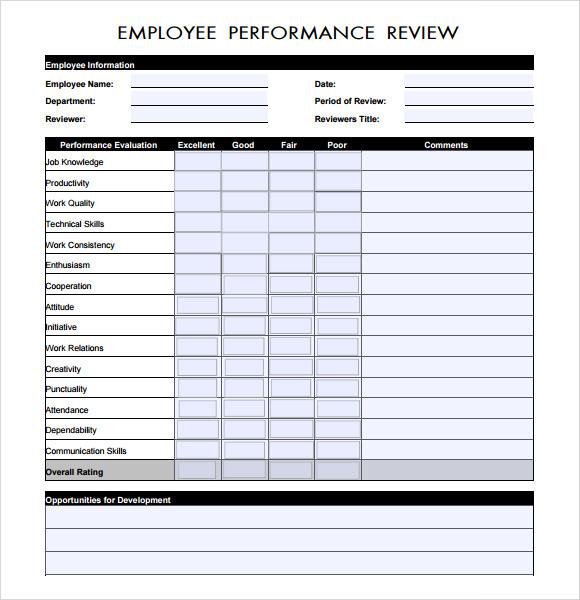 This employee performance review template, as the name suggests, is a template for reviewing the performance of employees. It includes the name of the employee, department, reviewer, date, period of review, reviewer’s title. Below there is a table with the attributes of the employees, and columns judging the performance under the heads, excellent, good, fair, poor, comments, and then it has the overall rating. Down below is has a table showing the opportunities for development. 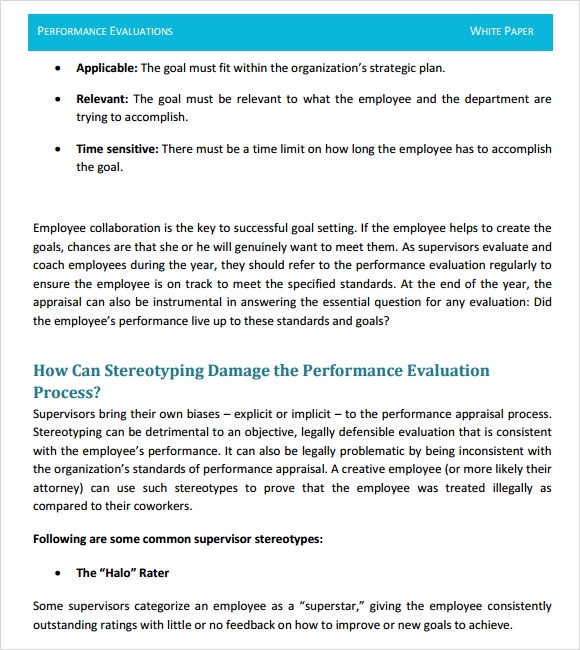 This employee performance evaluation template, as the name suggests, is a template for evaluation of employee performances. It is titled employee performance evaluation, and contains slots for name, hire date, position / title, location / department, employment status, last review date, immediate supervisor, date, type of review, and below it contains instructions for evaluation. 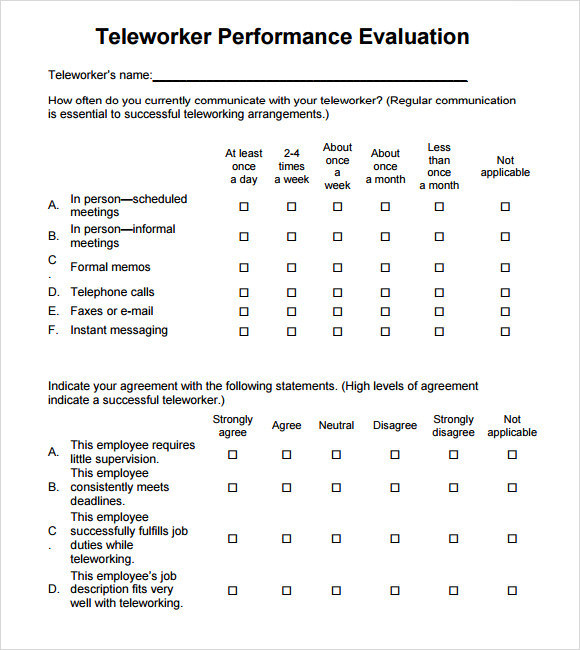 This sample performance evaluation template, as the name suggests, is a template for evaluating the performance of an employee, and it serves as a sample to show what exactly a performance evaluation template looks like. It includes the name of the employee, his job location, and job title, last date of evaluation, Evaluation instructions and procedure. 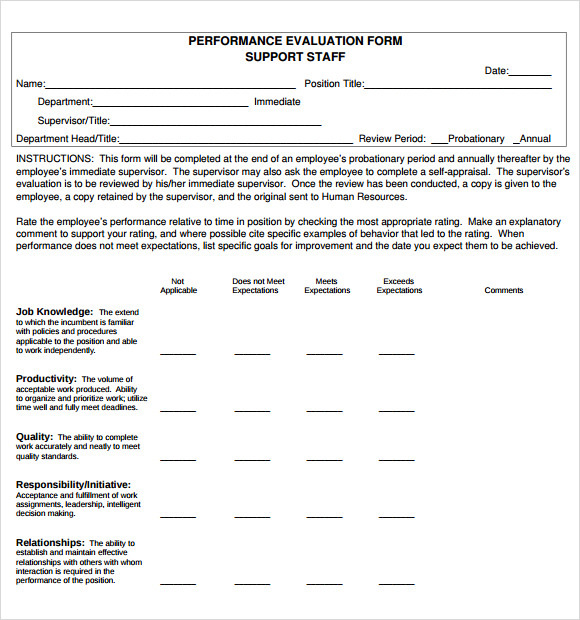 What Are Performance Evaluation Templates? An evaluation basically stands for a test. Evaluations are used as parameters to judge one or more attribute of a person, organization, object, etc. It has a wide framework, and has a broader approach in its applicability. A performance evaluation stands for the evaluation of an individual’s performance. It can e defined as the determination of a person’s work related actions and their resulting outcomes. 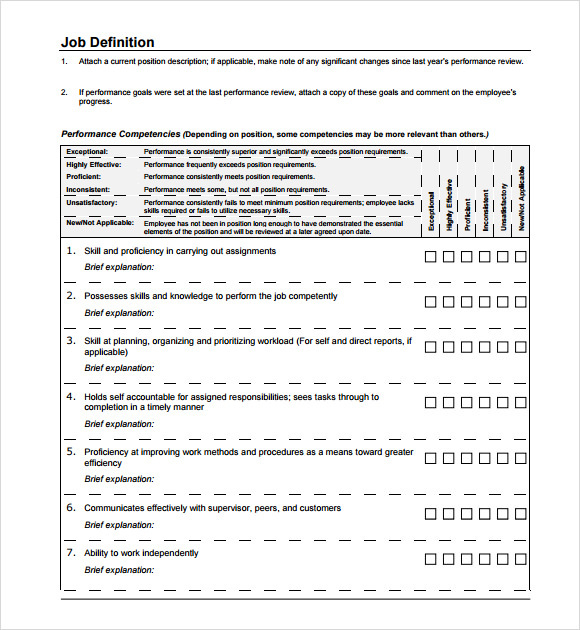 A performance evaluation template does exactly that, it assists in judging an individual’s work performance.You can also see Program Evaluation Templates. What Are The Benefits Of Performance Evaluation? Motivation and Satisfaction- It helps to keep employees motivated and judge their satisfaction. Training and development- It helps in understanding their strengths and weaknesses, and providing them proper training accordingly. Recruitment and Induction- It also helps in hiring new recruits. How To Prepare Performance Evaluation Templates? Performance evaluation templates cannot be prepared by anyone and everyone. It includes the application of a lot of scientific principles, and understanding the psychology of the individual under evaluation. So it is impossible for a lay man to be able to prepare a proper evaluation template. There are professionally trained experts meant for these jobs, so it is best left to them. Since performance evaluation has a lot of inherent complications, it is not possible to be created by anyone and everyone. So we have brought you a collection of some of the best performance evaluation templates that will help you judge in your employee appraisal. Download any of these and you will be good to go.You can also see Sample Project Evaluation Templates.